So - Kiev! First of all it turns out that you're now supposed to spell it Kyiv. 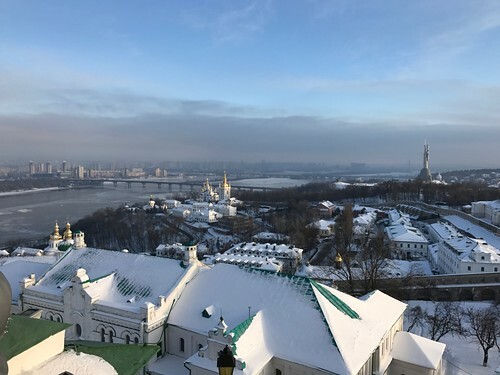 Kiev is the aglisized version of the Russian spelling, whereas Kyiv is the anglicised version of the Ukrainian spelling. In Ukraine it's now officially Kyiv, and even the Lonely Planet spells it that way so I suppose I should get with the times. 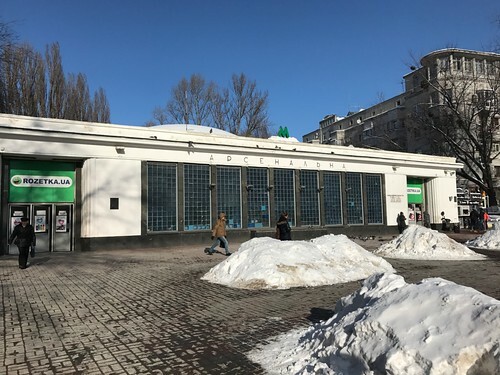 I know this about the Lonely Planet, by the way, because the Intrepid Raul had already blazed the trail to Kyiv and loaned me his LP, which was my constant companion during the four days I had in the city. This trip was less about being a tourist and more about having a break from work, even though work is busy enough that I almost bailed out completely. Instead, I took my computer and spent most mornings catching up on bits and pieces of work and hanging around the apartment. Then I headed out to be a tourist for the afternoon before going back home to put my feet up with a glass of wine and then finally venturing forth to stuff my face with stodge and pork products. This turned out to be an inspired and humane approach and one I might just to in all future trips, though hopefully with less working-in-the-morning and more louning-in-the-morning. Freeing oneself from the touristy need to fill every minute of the day is liberating. But what about Kyiv itself? It felt comfy. Perhaps it's my increasing familiarity with former Soviet states, but I felt like I recognised it. It's got its share of Stalinist architecture and wide Soviet style streets. And there's Cyrillic everywhere, and the stick-to-your ribs food and the hopeful sense of a young country that's shaking off its subjugated past. And as a Canadian prairie kid, I grew up with friends and neighbours called Misanchuk and Shevchuk and Boyko, ate my share of perogies and cabbage rolls and sat though more than enough Ukrainian dance performances. 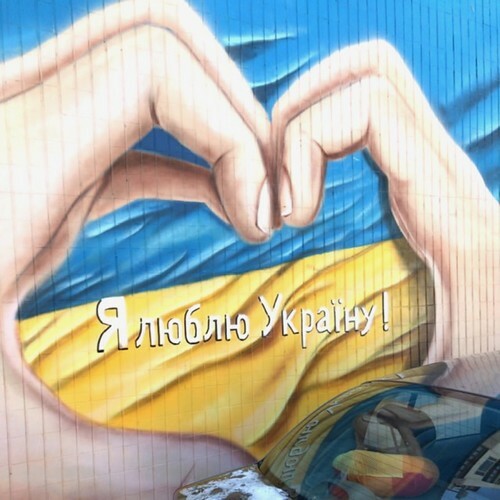 About 1.2 million people in Canada identify as at least partly Ukrainian, giving Canada the third largest population of Ukrainians in the world (after Ukraine itself and Russia). So like I said, I was in familiar territory. 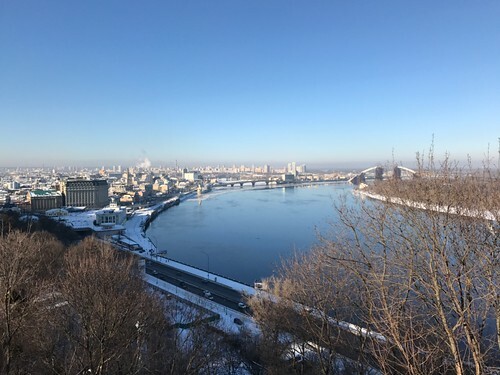 I had the best part of four days in Kyiv, which was plenty of time to hit the high points. And it turns out that Kyiv has, literally, got a lot of high points. Something I noticed right away is that its very hilly. The Dneiper river dominates the city, part of which sits on a high hilly ridge along the river, and part - the older bit - lower down along the river itself. Here’s the climb from the downtown area towards my apartment. This is just one of the escalators. The station is 105 metres deep! 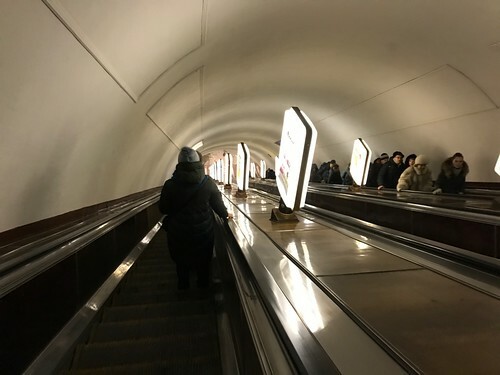 The metro dropped me on the main drag, Kreshchatyk, where I tried unsuccessfully to find the famous Independence Square (you probably know this as "The Maidan"). Undaunted, I followed the tour as best I could, consulting the LP and Google Maps with freezing fingers and wandering in the bright cold through Marinsky Park and along the Dneiper, which truly is quite impressive. 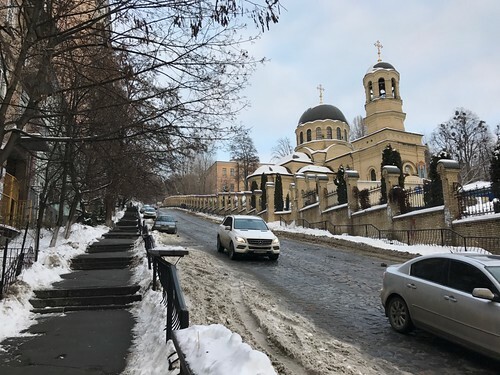 After my bacon and cheesecake breakfast and a suitable loll about in the apartment on Friday I set out to visit the Kievo-Pecherska Lavra, one of Kyiv's not-to-be missed sites. 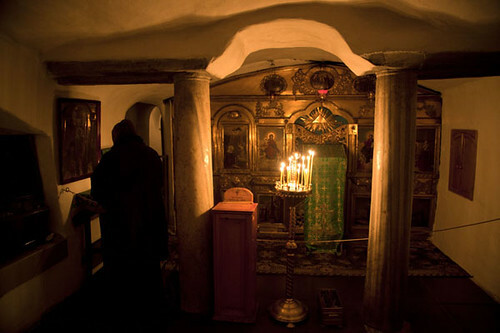 "Lavra" is the word for a senior monastery, and Pecherska means "of the caves", so it's a monastery of caves. Sitting up on the high banks of the Dneiper, it's been the site of a monastic settlement since the 11th century, when a reclusive group of monks set themselves up in some existing caves and gradually enlarged them over time. The monastery grew, including more caves and buildings above ground as well, until the site now covers about 28 hectares. It was a 30 minutes walk from the apartment, though on the way I stumbled across another spot that really deserves mentioning. I’m ashamed to say I’d never heard of this event before. Holodomor is a Ukrainian word that roughly translates as “death by hunger” or more specifically “murder by starvation” and refers to a man-made famine in 1932-33 caused by Soviet policies under Stalin that killed somewhere between 2 and 7 million Ukrainians. The events in Ukraine were part of a larger famine in the wider Soviet Union that happened partly as a result of poor grain harvests, but in Ukraine was hugely exacerbated by government policies such as the collectivisation of farms, the ever-increasing quotas required from them, and the brutal punishments exacted when enforcing those quotas. There are reports that taking even a few grains of wheat from the fields for oneself could result in arrest and execution. At its height starvation was killing 13,000 Ukrainians every day. It seems astonishing that I can not have known about this, but until the fall of the Soviet Union little was known about the event in the West. The Soviet government vehemently denied the scale and causes of the famine, and it only began to become widely recognised in the 1980s. Interestingly, the first Holodomor memorial in the world was erected in Edmonton, Alberta in 1983. And Saskatchewan was the first jurisdiction in North America to recognise the Holodomor as genocide (a topic that is still widely debated). In Ukraine, public denial of the Holodomor was declared illegal in 2006. The museum under the memorial is small and mostly in Ukrainian so I didn’t spend a lot of time there. But as I was leaving the women at the front desk asked me to stop and sign the visitor book, and then when they found out I was from Canada they gestured me into a side room where they played a short video in English. As I was watching, I couldn’t help but think the accent of the narrator sounded familiar, and at the end I was surprised and proud to see that the film had been produced by the Canadian Museum for Human Rights in Winnipeg. 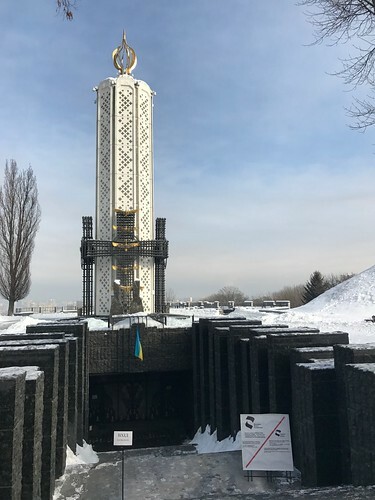 Oh, and there’s a memorial statue near the Kyiv Holodomor museum called “Bitter Memory of Childhood”, a copy of which stands on the grounds of the provincial legislature in Winnipeg. It was all very full-circle-y. I didn't take any photos, so these are provided by Google. 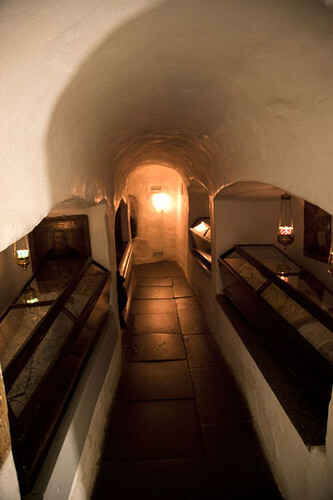 The smooth white corridors are lined with niches and small rooms off to the sides, all of which house tiny glass-windowed coffins holding the earthly remains of the monastery’s most devout and revered inhabitants. They’re all covered in ornate gold-embroidered cloths, though in one or two places you can see and shrivelled toe or hand poking out. As we walked through the low corridors, my guide mumbled a seemingly endless and slightly monotonous litany about each saint we passed. “Here is the holy relic of St. Nestor, the chronicler…” and so on. It was interesting, but also weird. It was also fairly busy, and most of the people there were clearly worshippers - they’d stop at each coffin and cross themselves, often bending to kiss the coffin. It felt really intrusive to be there, but it was also fascinating. I think the whole tour took about half an hour, and by the end I was very ready for a bit of fresh air and some lunch. Luckily, there was a small cafeteria on site that was obviously there to serve not just the tourists but also the staff and the monks who live at the site - it’s still an active working monastery. The cafeteria was warm and cheap and was serving hot food and strong tea. 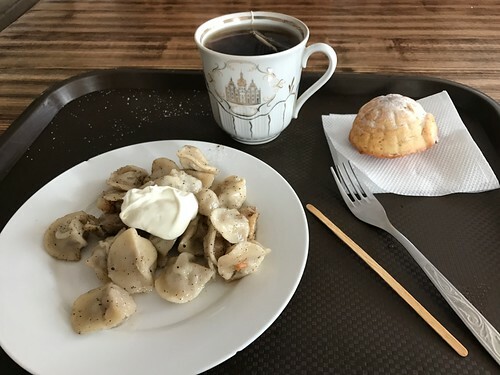 I got a really nice plate of pelmeni with smetana and a cup of sweet black tea and a very tasty cake of tvorog for the grand sum of £1.12. It was really really really good. Plus the cake was shaped like an igloo. Or possibly a turtle. Or probably some kind of igloo-turtle hybrid. Thus fortified, I wandered out to see what else there was to see in the Lavra complex, and ended up finding the Great Bell Tower. This turned out to be the utterly excellent. The bell tower was constructed in the mid-eighteenth century and was recently renovated. I wasn’t sure what to expect, but figured I’d at least get a nice view and the chance for a few photos take with frozen fingers. When I got to the top of the slightly treacherous frost-covered stairs I was so delighted I laughed out loud. 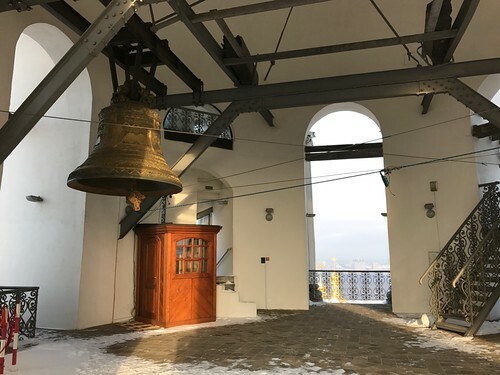 The top opens out to amazing views across Kyiv in all directions, and since the renovation, all the bells have been re-hung with the ropes that control them strung across the room. And I had the whole place to myself. It was fantastic. Yes, it was drafty and freezing, but there were big beams and ropes and pulleys and giant bells and so how could you NOT love it? I lingered for as long as I could stand, with my fingers getting more and more numb and my nose getter more and more sniffly. Then another group of tourists arrived, which I took as my cue to leave. I picked my way down the slippery stairs feeling very very satisfied with the day’s efforts. Bacon, Holodomor, caves, mummies, pelmeni, bells… and there was still more to come. However, this blog is already a bit long, so I think I’ll pick up Part 2 later. Rest assured there will be more sites and more bacon and, finally, perogies and Chicken Kiev! Kyiv just got added to my bucket list - but maybe not in winter. Love the view from the bell tower. In a bit of a full-circley kind of way, I also knew nothing of the Holodomor until I visited the Museum for Human Rights in Winnipeg last summer where there is a whole display on it. We probably watched the same film. I was kind of embarrassed that I had never heard of it as well. In fact a good part of the display is about how it was covered up by one western reporter while another was trying to uncover it. If you've never been, you need to go to the Human Rights Museum next time you are in Winnipeg.